President Obama wanted to warn the American public that Russian foxes were in the electoral henhouse back in the summer of 2016 but Republican Senate Leader Mitch McConnell said "No", refusing to share Obama's bipartisan warning with the american people. That's why you only heard about Hillary's emails and not t-Rump's collusion with the enemy in the days before the vote. As for treason, of which Mitch is no doubt also culpable, a conviction for treason would be icing on the cake. Bring on that Blue Tsunami! I am the Red Hen. I am Maxine Waters. I am Patricia Okoumou. I am Kristin Mink. I am Robert De Niro. I am David Hogg. I am Emma Gonzelez. I am Mike Avenetti. I am Stormy Daniels. I am Rachel Maddow. I am Pickaxe Guy. I am LeBron James. I am Robert Mueller. I am Alexandria Ocasio-Cortez. I am Peter Strzok. I am Elizabeth Warren. I am Heather Heyer. I am Beto O'Rourke. I am Andrew Gillum. I am Senator Sheldon Whitehouse. I am Botham Jean. I am Plaid Shirt Guy. I am Ronan Farrow. I am Christine Blasey Ford. I am Julie Swetnick. I am Deborah Ramirez. I am Colin Kaepernik. GOP elephant: You're allowed to inspect the farthest back corner of the lowest shelf of the closet. 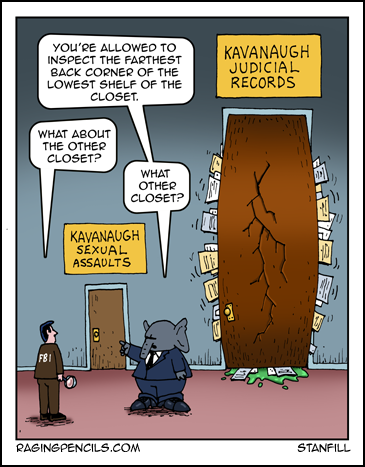 FBI: What about the other closet?